Turkey Point Lighthouse is situated on a bluff that separates the Northeast and Elk Rivers in Maryland. The lighthouse was constructed in 1833 using the same plans as the Concord Point Lighthouse. The lighthouse itself stands a mere 38 feet tall, but positioned on the bluff it is actually 129 feet above the water. 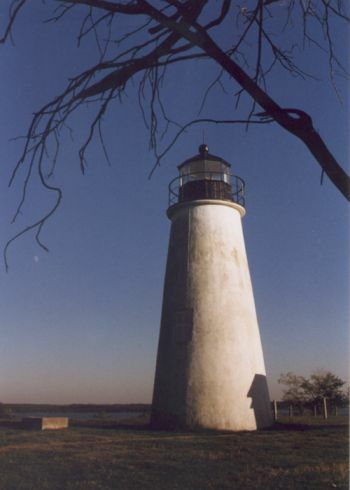 Turkey Point is known for having several women lightkeepers, the most famous of which being Fannie Mae Salter. In a time when hiring women as lightkeepers was not a common practice, Fannie Mae Salter fought to keep her position after her husband died in 1925. Eventually, Fannie Mae Salter was promoted to keeper by President Coolidge, a position she held until 1947 when she retired. She is referred to as the last of "the Lady Lightkeepers". Turkey Point Lighthouse is about a mile hike though the Elk Neck State Park. The keeper's quarters were destroyed by vandals and torn down. Only the oil house and the lighthouse remain. The view from the bluff is incredible and worth the trek through the nature path. This photograph is one of my favorites. It was taken on a crisp October day in the late afternoon.